In early May of 2009 a stomach bug hit me. I recovered and hopped on a plane to Hawaii for a vacation. I was 26 years old. I had slow onset with various symptoms trickling in over the last few days we were on our one week trip. Prior to the trip I had been having back pain, I happily noted on vacation that when I bent over to spit while brushing my teeth I suddenly had no back pain! Then my mouth started to feel numb; I explained it away as having a reaction to different foods/toothpaste. Plus, we had just had snow cones and my mouth normally goes pretty numb. This time it lingered. While out swimming in the ocean I smacked my foot into a bed of coral and broke a toe. Couldn't feel any pain to it and figured it was a bad bruise. I also cut swimming short because it was pretty exhausting fighting the waves to stay afloat. Figured I was out of shape. Went for a hike on Diamond Head and had the hardest time with the stairs. I figured maybe change in altitude was messing with me. Got a bad sunburn; when we got back home and I went to shower, I had a super hard time washing my upper body and shoulders. I thought the sunburn had just exhausted me and my arms were tired from the sun/swim. When it came time to pack the car up, I could barely lift my luggage and had to have my husband help. Again, I figured it was all just normal exhaustion from the trip. Finally boarded the plane home and during the last hour of the flight, I started to feel a bit claustrophobic and felt like I just needed to get up and move around. Stood up and stumbled down the aisle (and probably looked drunk.) Figured sitting for 9 hours probably just put my legs to sleep. Once landing in Houston, my husband carried my bags; once we met up with my dad, he helped too. We decided to stay an extra day in Houston before heading home because I was so tired. I figured it was just jetlag or something. Had a horrible time climbing the stairs at my parent's house. Finally made it home to Austin and had already scheduled to meet with a physical therapist about my back pain for the next day. That night, I felt like I was having an asthma attack; we had been away from our cats for a while and I figured my allergies might have triggered one from not being around them much. I had a weight in my chest I just couldn't shake, so I got up and stumbled around a bit to try and get more air in my lungs while standing around in the living room. The next morning I went in to the physical therapist. When he saw my gait and inability to balance, he sent me across the street to my general doctor. General doctor was out, so I met with one I hadn't met before, and she scheduled me for a CT scan. She told me it could be cancer. Promptly made it outside to call my boss and let him know I might be out for a few days before breaking down. Started feeling a little weird but couldn't explain the feeling. I drove home to wait for my CT scan. Along the way I prayed that my legs would hold out until I got home. It was a scary drive and I shouldn't have been behind the wheel at that point. Waited at home for the CT scan and called my husband to drive me. When we got out in the parking lot, I could stumble about 8 steps before I had to stop, rest and catch my breath. Went through the scan and husband helped me undress and dress. At some point I lost a sock... They told me I would receive results in 24 hours. We went home, I rested, and before bed, my husband had to help me shower because I was just so tired. It was hard to lift my legs to get into the garden tub to shower. 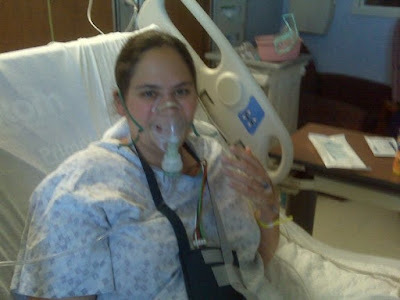 That night I felt like I was having an asthma attack again and when I went to get out of bed, I hit the ground. I yelled out to my husband and he helped me back up to the bed, and we decided to head to the ER. He helped me get dressed and helped me walk to the car. Once I was standing I could kind of shuffle along if I could hang on him. Once at the ER, he was able to help me shuffle to a column outside the hospital and then ran inside and got me a wheelchair. Once admitted they got me on a breathing treatment for my 'asthma attack' and start questioning about medical history and such. By this time I texted my parents a general run down of what was going on. My mom's friend, who used to be a nurse, was the first to tell me to ask the doctors about Guillain Barre Syndrome. Before we had a chance to ask, a nurse returned with the same idea. The stomach bug from two weeks prior was the clue. I then had a spinal tap and the elevated protein count confirmed for GBS. I was then admitted to the hospital and my condition continued to decline over the next few days. I had issues with temperature control, my right side would be flushed and be painfully hypersensitive and burning up while my left side remained normal. My ability to move my legs at all was soon lost and swallowing became difficult. While my hands and fingers did go numb, I could still hold a pen for the most part and scribble notes. I soon lost the ability to move my arms. My talking was slurred and I was often breathless. When breathing became too hard, I was then put on a respirator. By that point, I stayed pretty drugged up until the respirator was removed a few days later. At my lowest point, I was pretty much paralyzed from the neck down with blurred vision. I was then using glasses and noticed that my vision was much more blurry and sometimes had double vision. I then began small amounts of physical therapy. Throughout my stay, I got to see a lot of medical students; they would come in and question me about how my symptoms started and when/how I was diagnosed. During my hospital stay I told all my friends and family to not take any photos because I wanted to forget this entire ordeal as soon as possible. Now I kick myself about that because it would be nice to have a concrete image of how far I have come rather than vague memories. June 1st, I was transferred to a neuro-rehab. I then developed a constant piercing headache that Percocet would not even come close to fixing. My neurologist said the next step was either morphine or a nerve block. I opted for the nerve block. After getting it on both sides and having a Percocet soon after, it knocked me out hard and suddenly it felt like a wall had been torn down and the Percocet was doing its job. I think I stayed there for around one month. Recovery was slow until I had a chance to get moving in the pool; then it became a lot easier to start climbing my way back up. I left the rehab using Neurotin and Butalbitol. I then continued Out-Patient Therapy from July-September. 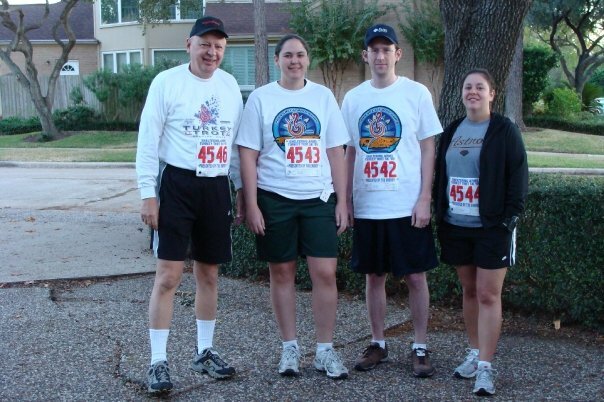 I joined Gold's Gym and got a personal trainer and continued training through November where I was able to participate in the Houston Turkey Trot for Thanksgiving. I then began training for a half-marathon to walk/jog with my sister. The headache persisted and over two years we attempted to deal with it as a migraine. Some medicines did nothing. Topomax let me experience word loss as a side-effect and gave no benefit, and eventually we gave Cymbalta a shot to tackle both the headaches and overall body neuropathy (35mg if I remember right.) The side effects were hellacious for the first two months and then evened out; I stayed on that for 3 years. Weaning off it was again horrible with nightmares and other side effects, but once off it, I felt the same, so it was time to be off it. However, the headaches were never really helped much with Cymbalta (knocked the constant level 6 down to a 4 most of the time but even then once the pain started to increase it would still rack up to a 6-8), and we were still trying to figure out a way to tackle them. Nerve blocks given once every three months were still helpful, but that didn't help with the daily mounting pain.